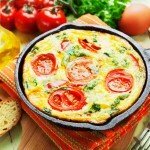 » Tomato Spinach Frittata Tomato Spinach Frittata | Gluten Free Daily | Weight loss. Wellness. Fitness. Preheat broiler to high. Adjust racks to allow your frittata to be placed center oven. In a medium bowl, lightly beat the eggs and egg whites with a fork, add salt and pepper to taste, and stir. Coat oven-safe skillet with cooking spray, we like olive oil spray. Add the spinach. On the stove, heat over medium heat until spinach wilts slightly, roughly 30 seconds. Add the tomatoes and any optional produce. Add the eggs, and cook over medium heat (covered if possible.) Don't stir. Cook for roughly 5 minutes, or until edges begin to set. Place skillet under the broiler for 3 to 5 minutes. Broiling time will vary, so check in at minute 4 to make sure your eggs don't burn. 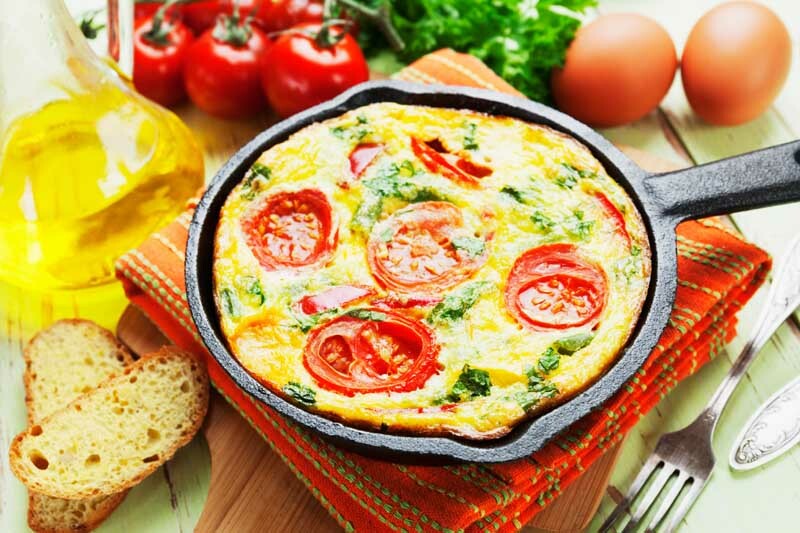 The frittata will continue to cook even after you remove it from the oven, so keep that in mind. It's good to pull the skillet out slightly before you think it's done so eggs don't become overcooked as they cool in skillet before serving. Serve warm and enjoy!